Who doesn’t like the idea of open source, of sharing, and that every one who is able to can change software to his/her likings and share the changes with the rest of the free software world? Unfortunately, it takes a big deal of self-restraint to only use completely liberated software. Who can resist the attraction of shiny animations on websites (Flash), or those of playing music on your iPod (which does not support any of the free formats that are superior in so many ways)? 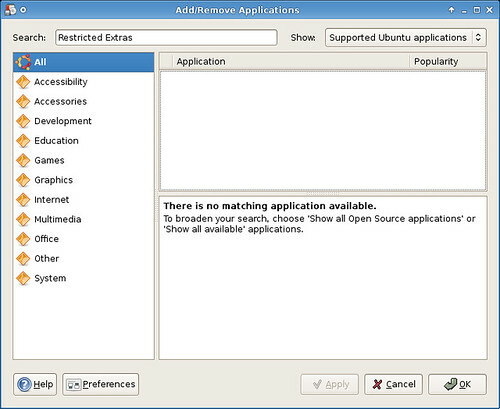 To broaden your search, choose ‘Show all Open Source applications’ or ‘Show all available’ applications. So, in the top right-hand corner, I select “All available applications” and, what a surprise, there it is! Hmm… If you are a person (as in: not a company) then it should be legal for you to install these packages. I am a person, so I click “Install”. However, the purpose of this window isn’t entirely clear. Indeed, the button said “Install”, but it actually meant “Enable”, as in “enable extra repositories” (i.e. locations to download software from). So, if you were thinking the package would now be installed: you’re wrong. 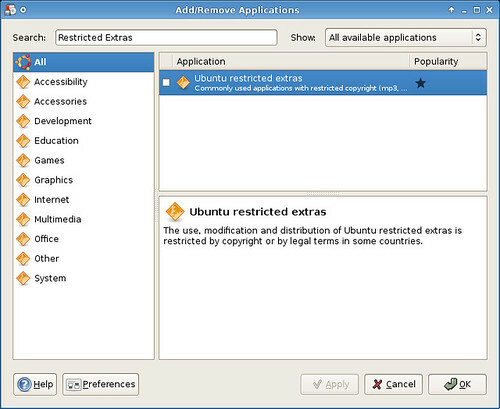 In fact, the checkbox in front of “Ubuntu restricted extras” is still unchecked. Check it now, then click OK. You will be asked if you are sure, click “Apply”. The packages will then finally be installed. There you have it! You can now play your music and watch YouTube (and yes, you can use Gnash for that, but more likely than not situations will occur where you need a version of Flash later than seven). You can use Java (which will be open sourced and thus can be included in future releases of Xubuntu) and websites will now be displayed in the fonts their authors wanted them to be displayed in! Enjoy! 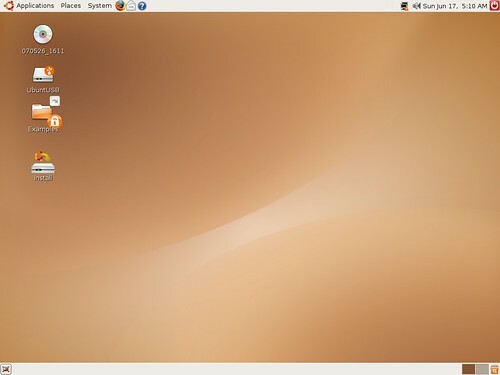 Note: the next version of Xubuntu, Gutsy Gibbon, will introduce Xubuntu Restricted Extras, which will install packages more appropriate for Xubuntu. I always have to laugh a bit when I see advertisements for computers loaded with Windows that can dual-boot (!) both English and Dutch versions of Windows. One of the greatest advantage of using Xubuntu (or Ubuntu, or whatever) is that it is easy and, no less important, free of charge to use it in different languages. In fact, you can use different languages on a per-account basis! To set it up, you just have to open Applications->System->Language Support. 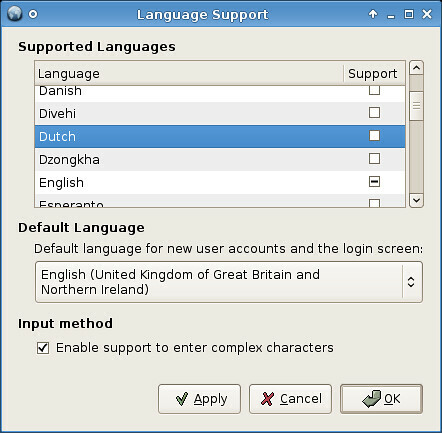 From there, you can browse through a list of supported languages. I personally prefer British English (which I also set as the default language in the drop-down menu at the bottom), but my sister does not speak English and therefore would like to use my system in Dutch. No problem, I just scroll through the list, select “Dutch” and check the checkbox under “Support”. Now I can click “OK”, upon which it will download the selected language and set it up. And if you later install other applications that have been translated to the other language, that other language will be automatically installed with it. Unfortunately, translating every single piece of software is a huge job, mostly done by volunteers, so not everything will be translated. But the most important software has mostly been translated, and using a partially-translated operating system is already way easier than using one in another language. 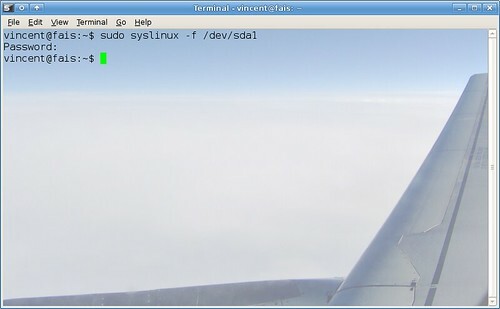 Xubuntu Feisty – now from USB drive! IMPORTANT NOTE: Unless for some specific reason you want to run Xubuntu version 7.04 specifically from your USB Drive, this tutorial is deprecated. I’ve written an updated and much easier tutorial on how to run the latest version of Xubuntu from your USB flash drive. In my previous post I showed you how you can run Ubuntu Feisty Fawn from your USB drive, and have it preserve any changes you make. 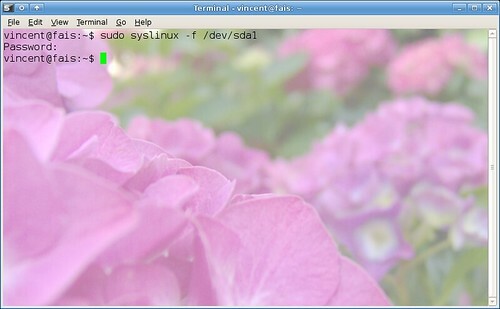 In this post, I’ll show you how to do it with Xubuntu. And of course, as usual, you can also view the screenshots as a slideshow. Using Xubuntu has a few advantages. The first one is that it is more appropriate for this blog (hence the name Xubuntu blog 😉 ), and that I like it better. The second one is that it is faster than Ubuntu, which is quite handy seeing that running it from a USB drive (or flashdrive, pendrive, memory stick, or whatever you’d like to call it) does bring about a speed decrease. The third advantage is that it takes up considerably less space on your USB drive. About 70 MB matters quite a lot, especially if you’re using a 1GB drive (which is the minimum). But I hear you thinking: didn’t Ubuntu 6.06 “Dapper Drake” already introduce the possibility of such a “persistent liveUSB session”? Why do we need a specific tutorial for Feisty? OK, perhaps you didn’t think that. But you would be correct if you were: it is already possible since Dapper. However, some packages in Feisty introduced this bug which prevented this feature from working. To work around this bug, we will use some packages from the previous version, 6.10 “Edgy Eft”, which do not suffer from this bug and which most likely won’t cause you additional problems. Before we start, I’d first like to thank everyone who has worked and is still working on fixing this bug (more details on the bug page and the forum thread) and especially Mike (mjpca) for providing this teporary workaround. His writeup of the steps he took allowed me to do the same for Xubuntu, also using this great guide from “bibe’s” site. And last but not least, this guide would not have been possible without the detailed How-to from Debuntu on how to install Ubuntu on a USB pendrive. First off, be sure to realize that this will wipe all existing data on your USB drive. Furthermore, these instructions are geared towards Xubuntu, but they’ll also work on other Linux distributions if you change the instructions a bit (e.g. perhaps you use another program for partitioning). It might also work on Windows (I know “syslinux” is available for Windows) but then the instructions will probably differ a lot so it’s your own responsibility. You need a USB drive of at least 1GB but as that only leaves about 240MB for any additional programs you’d want to install or documents you want to save, I recommend you to use a USB drive of 2GB or more. 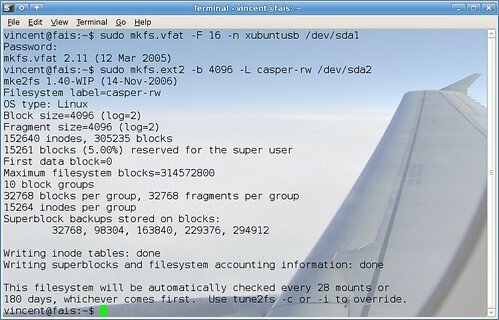 The process of putting Xubuntu on your USB drive is not that difficult. Basically we need to divide your USB drive in several regions (partitioning), one of which will hold the modified Xubuntu and one which will hold all your documents and settings. However, because this will take a while, I suggest you already start downloading the modified Xubuntu image generously hosted by pepeio (I have also created a XubuntUSB torrent, hosted on LinuxTracker. If you know how to, please use that torrent.). As your partitions need to stay unmounted, I recommend you to turn of “Volume Management” (you can turn it on again after you have finished this tutorial). To do so, open Thunar, click Edit->Preferences, then switch to the “Advanced” tab and make sure “Enable Volume Management” is unchecked. 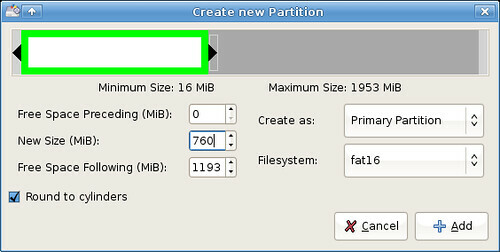 Right click the “unallocated” space and select “New” to create a new partition, the one that will hold the modified Xubuntu. Set it to be 760 MB (Gparted calls it MiB) and set the filesystem to “FAT16”. 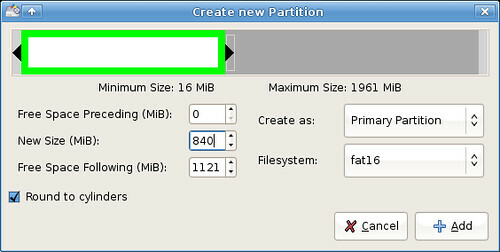 Then create the second partition, which can take up all the remaining space. Set the filesystem of this one to “ext2”. Now, click the checkmark or select Edit->Apply to apply your changes. 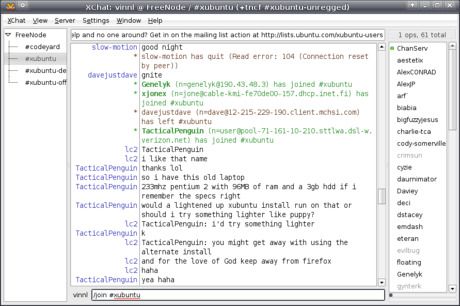 If everything went allright, you should now be able to run XubuntUSB, congratulations! If it didn’t work for you, see “Troubleshooting” below, if it did, please leave a notice in the comments. Thanks! 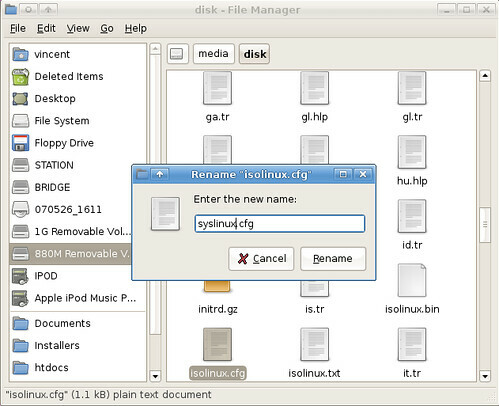 Another note: For those who don’t like the amount of files on their USB drive, Fisslefink posted a great how-to which guides you to using GRUB instead of Syslinux, so that only two folders will be used. It didn’t work for me, but since he also includes instructions on how to revert back to Syslinux, there is no harm in trying. If you experience any troubles, please first check if your problem is in the following list, and if not, please ask for help in the forum thread. If, upon boot, you get the message no partition active , you have to set it active for boot. Open up a Terminal (Applications->Accessories->Terminal) and type sudo fdisk /dev/sdx (you know, replace sdx with your drive). Press “a” and then “1”. Press “w” to save and then it should work! You might think it is weird that your casper-rw drive shows up on your desktop, and actually, it shouldn’t, but everything still worked as it should with me, so it should not be a problem. Note that you cannot browse it, though.